Stay Fresh, Have a Fruitas Shake Muna! "Shazam!" Is the Most Fun DC Movie Yet! Answer this, Bingers: are you a foodie or are you a gamer? I am both! I enjoy food and given the time, I would just spend an entire day at home playing with my PS4. If you are like me, I discovered a new place that you would love to hang out in. Bingers, read my experience at The Garage VR Zone + Food Park in City of Dreams Manila! Last October 14, we joined the Blogapalooza fam for a special fun day at The Garage! It was their media launch and a very exclusive event. Alright, let’s get down to it! What should you expect at the food park? What are the games? And most of all, what are the rates? Here we go! The Garage is a mix concept of a food park and a gaming zone. At the moment, there are 10 concessioners to choose from. Each of them offer various tasty treats that will fill you up after trying the exciting games or give you energy to try them all (the sequence of which, it’s up to you! The Little Binger explores The Garage Food Park + VR Zone in City of Dreams Manila! During our visit, each of of us were handed food stubs that we can use in any of the concessionaires present. Of course, I indulged the coffee-lover in me with a cup of Iced Macchiato with Black Pearls from The Roaster and helped myself to an order of Tokyo Dog from Pink’s. My friends got ramen from Santouka and pizza from Pizza Grigliata then just like the true bloggers that we are, we compiled our orders to create several flatlay food shots. Now that we stocked ourselves with some fuel for the games, we then entered the OASIS (sort of), the VR Zone. At the moment, Bandai brought in three of their signature games, namely: Mario Kart VR, Ski Rodeo, and Hospital Escape Rodeo. If you grew up playing Mario Kart and made some enemies along the way because of its crazily-competitive gameplay, well, it got an upgrade at the VR Zone! i particularly loved grabbing turtle shells from the air and hitting my enemies with hammer. Ski Rodeo, on the other hand, was the closest that I can get to hitting the ski and jumping off the slopes. And yes, falling off of it nearly gave me several heart attacks! Speaking of heart attacks, one game that we queued up for an hour nearly killed me! Imagine navigating your way around a haunted hospital in a wheelchair and you have to dodge your way to safety. Yep, that’s the plot of Hospital Escape Rodeo! The cooperative game which runs for 9 mins can accomodate up to 4 players. Each player should make it till the end or else, the game ends. We luckily survived the game, after several shouts, of course! The rates at VR Zone. 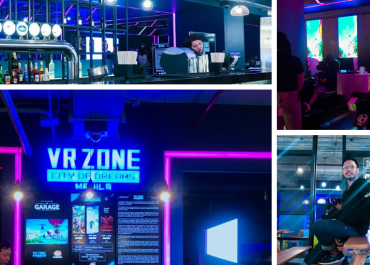 The Garage VR Zone + Food Park is located at UGF City of Dreams, Asean Avenue cor., Roxas Boulevard Entertainment City Manila, Parañaque, 1701 Metro Manila. They are open from 10 AM to 2 AM. PREVIOUS POST Previous post: RAWR Awards 2018 Will Roar At Le Reve! The Little Binger is a wandering millennial who is always on the lookout for what’s new and interesting. Food, movie, events- it’s all right here! Keep on bingin’!